Quasars were once known as quasi-stellar radio sources due to their intense but nearly point-like source of radio energy. When first discovered in the 1930s, little was known about their underlying cause. By the 1950s we knew by their redshifts that they were billions of light years away, which meant they must be unbelievably luminous. We now know that quasars are active galactic nuclei, powered by supermassive black holes in the centers of galaxies. Quasars occur when the black hole of a young galaxy consumes large quantities of gas and dust. During this active stage of the black hole the material is superheated and large jets can be emitted by the black hole. It’s thought that most, if not all, galaxies enter such a stage in their youth, but this intense active period is short-lived on a cosmic scale. So it’s unusual to see several quasars clustered together. 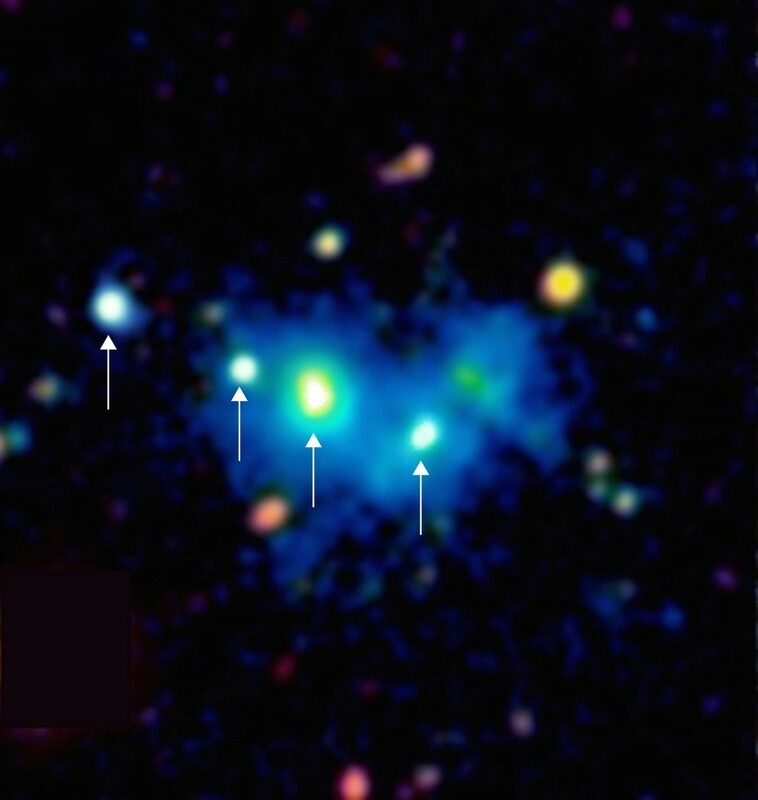 But now we’ve found a rare quartet of quasars, and it’s raising a few eyebrows. The discovery was presented in the latest issue of Science, which finds four quasars in a single large nebula. The nebula is about a million light years across and has a mass of about 100 billion Suns, which is surprisingly large. But the presence of four active galactic nuclei is highly unusual. Quasars make up a relatively small fraction of galaxies, so the odds of four of them being so closely packed purely by chance is about 1 in 10 million. This would seem to imply that they have some kind of common origin, but it’s unclear what that might be. 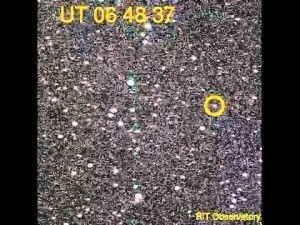 The usual computer simulations don’t predict this kind of close quasar alignment. It’s possible that this is just an odd random clustering, or it’s possible that our models of galaxy formation might have to be tweaked, but it’s too early to tell at this point. Why is this considered a large nebula? The milky way is 30kpc across and has similar mass… And the early universe was denser than today. It’s large given its density over such a wide scale. The largest known is estimated to consume matter equivalent to 600 Earths per minute. I’m guessing we’ve discarded the quasars being mirror images from a gravitational lens, correct?